We are proud to finally share the story of one of H4H’s education life-scholarship (a unique program that lasts for the duration of a student’s studies, as long as they continuously maintain high academic averages) recipients. Thạch and his brother Duy are part of the Cham minority, a population in Vietnam and Cambodia that has historically suffered countless atrocities, discrimination and ridicule. Despite the hardships of their childhoods, both young men are now thriving in their medical programs. Like many ethnic minority citizens in Vietnam, Thach comes from a very poor, disadvantaged family. 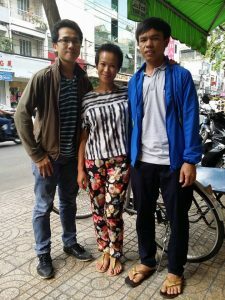 As an outstanding student, Thach was accepted at a university to study medicine, only to have his family ask him to turn down the offer because they could not afford the AUD1,000 a year to pay just his university fees. Thach has an amazing determination to change his life, help people, and break the poverty cycle in his family. During the summer holiday, he works as a mason’s assistant to earn ONE Australian dollar a day with the hope that he can pay some of his university fees and boarding. During the school year, Thach stays at a friend’s room in the suburbs, waking up at 3am to catch a bus to Saigon city, where he studies. He sometimes goes to Uni without food. Yet, Thach rarely complains, and operates with a single-minded determination to accomplish his dream of becoming a medical professional. 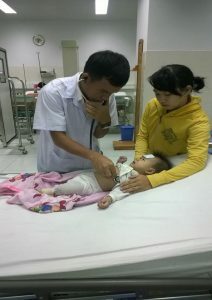 A once impoverished child who almost gave up on school and his life because of unbearable hunger, illness, financial and family hardship, Thach Dang (Đàng Hoàng Thạch) is now a final year medical student, and has been receiving the scholarship since he was in year 8, what’s more, his brother Duy is in his 5th year of medicines! Intelligence and determination run in the family. We are exceptionally proud of the continued work these two brothers put into their studies and their outstanding results that show for it!